Baking and Cooking, A Tale of Two Loves: Champagne Cupcakes-An Engagement Celebration! 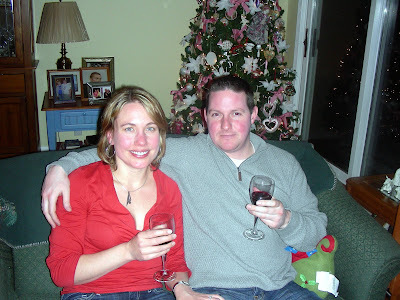 My son and his girlfriend got engaged over the holidays! Yahoo!! Our family has been anticipating this for some time, and we're very excited to say the least. We were having a little engagement dinner with them last week, and I knew that I wanted to make special cupcakes, Champagne Cupcakes. I saw on squirrelbakes blog, that she had made Pink Champagne Cupcakes and brushed them with additional champagne, before frosting. Good, I would do that, but I would use Brut champagne, not pink. So I set to work to make these wonderful cupcakes. Everything was going fine, the egg whites whipped stiff peaks. but when I went to fold them in the batter, the egg whites de-stabilized or deflated to almost liquid egg whites again. I wanted to cry. I kept my composure and I did what anybody web savy does, when they have a question, I googled, "Can I re-whip egg whites?' I promptly found that the egg whites need some type of acidic component to stabilize the egg whites. Beat in the cream of tartar the recipe calls for, or, if not specified in the recipe, 1/4 teaspoon per 2 egg whites of cream of tartar OR lemon juice OR vinegar, midway through whisking. This is helpful to stabilize them and keep them from liquefying again. I love Google!!! However, now I had to start over bringing 6 eggs to room temperature, very important, separating the whites from the yolks, and whipping these egg whites into stiff peaks, adding the appropriate amount of vinegar, midway. My egg whites were perfect this time and didn't de-stabilize! So, four hours later I had Champagne Cupcakes. I'm glad that I made these cupcakes the day before the dinner. than the next day I had to frost them. I wanted the pretty pink colored cupcakes that I saw on squirrelbakes blog, but, oops, I got too much red food coloring in the frosting, so they are a darker pink. These cupcakes were definitely a labor of love, and definitley special and delicious.. Here is a picture of the happy couple! Preheat oven to 350 degrees. Lightly grease or line two cupcake pans and set aside. In a medium bowl sift together flour, baking powder, and salt and set aside. Cream butter and sugar until fluffy in a large bowl.. Alternate adding flour mixture and champagne to butter mixture. In a large, clean, bowl beat egg whites**. Midway through beating, add 1/4 teaspoon per 2 egg whites of cream of tartar OR lemon juice OR vinegar.. This is helpful to stabilize the egg whites. Continue beating egg whites, till stiff peaks form. Be careful not to over beat, or egg whites will de-stabilize. Fold in 1/3 of the whipped egg whites and mix thoroughly. Add in remaining egg white mixture till combined. Fill cupcake liners with 1/4 cup of batter and bake for 18-20 minutes or until toothpick inserted in center comes out clean. Let cupcakes cool in pan for 5 minutes, then remove and let cool completely on wire rack. Once cupcakes have cooled, gently poke 8-10 holes in cupcake using a toothpick. Using a pastry brush, glaze the cupcakes with extra champagne. For frosting, beat butter till creamy. With mixer on low, slowly add in sifted confectioners' sugar. Once all sugar is incorporated beat on high for 3-5 minutes or until smooth and fluffy. Add in champagne and mix till incorporated. Fill a pastry bag with frosting and decorate cooled and champagne glazed cupcakes. Enjoy! oh wow, cupcakes look gorgeous! Kath and Dimah- Thank you so much for your kind comments. I'm not happy with the color, but otherwise, I'm happy with the way that they turned out. When I saw champagne cupcakes, I had to check this out. Way to go in saving the recipe! I'm sure your son and soon to be daughter-in-law would have loved them anyway. Congratulations. They look fantastic! really gorgeous cupcakes- looks fantastic! Congrats on the new addition to your family! I've only had champagne cake once -- a friend's wedding cake, and it was DELISH!!! Congrats to Da Bears!! What a beautiful couple...and what a great lesson in perseverance. I'm so glad that you were able to find a solution to your frosting problem. The end result looks just stunning, and I'm sure it tasted great too! Thank you for sharing your recipe with me. Warmest congratulations to your son and his fiancee. I can't believe the weekend is already over...I hope you have a fabulous start to your week! 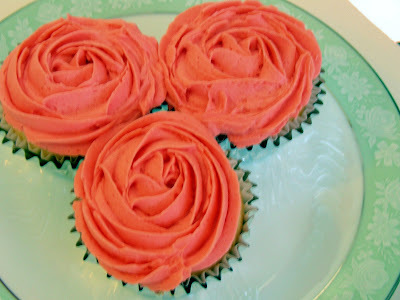 I love the piping design on your cupcakes ....they look just like roses. Well please congratulate them and yourself for me! How fun and a wedding next. I saw those cupcakes too and was thinking, I need to try those. Honestly I never bring my whites to room temp and they come out fine, but i do add a bit of the tartar.